Our Faith Community is diverse and involved! We have an active Youth Group. Click here to learn more about how our youth are involved. Breaking Bread Together – Groton Congregational offers many opportunities (though never obligations) to get together. Often these gatherings bring a reat combination of fun as well as fundraising for great causes in the community. 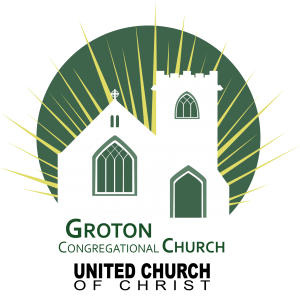 Bible Study – Groton Congregational offers opportunities for small group study. We are also open to new ideas and starting new groups. Care Team – Groton Congregational believes that we are a family of faith. And as a family of faith, in addition to serving in the world and bettering the greater community, that we have a special responsibility to each other as well. Whether it is writing a letter, making a meal or visiting someone in need, our Care Team strives to support each other when times are challenging and to lift each other up or walk with each other in difficult times. Women’s Fellowship – Our Women’s Fellowship involve gathering for conversation, having a good meal together, learning about important issues and making difference in the community. We meet the second Wednesday of the month from September through May at 12:30 p.m. in Dutton Hall. All women are welcome! Our Community Meals program is a way for us to reach out and serve our community. We are striving to nourish mind, body and spirit with healthy food, companionship and love. Join us on the first Saturday of each month in our fellowship space, Dutton Hall for a sit-down meal that is always delicious and healthy. On the second, third and fourth Saturday of each month bagged lunches for take out are available with a sandwich, snack and fruit. Interested in volunteering? Contact our Missions Coordinator, Linda at missions@grotoncongregational.org or fill out the contact form below. Would you like to sponsor a Community Meal? The Community Meals program continues to inspire people and expand its reach in our community and beyond! Opportunities exist to sponsor a week or a whole month. Click on the PayPal Donate button to choose your level of giving. Thank you!